Upper airway obstruction frequently presents to the interventional bronchoscopist, and common causes include malignant disease of the trachea and post-intubation airway stenosis. The physiological changes that occur with upper airway obstruction are a consequence of increasing turbulence of airflow at the site of stenosis and a consequent increase in airway resistance which leads to an increased work of breathing, hypoventilation and exercise limitation. Upper airway obstruction is associated with distinct changes on pulmonary function testing. 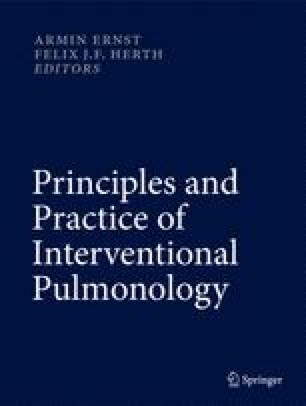 Careful inspection of the inspiratory and expiratory limbs of a well-performed flow-volume loop demonstrates three identifiable patterns of variable intrathoracic, variable extrathoracic and fixed airway obstruction in which there is flow limitation throughout the respiratory cycle. A number of quantitative criteria obtained from spirometry have also been found to have value in recognition of upper airway obstruction, in particular in differentiating this from chronic obstructive conditions such as COPD and asthma which affect the smaller airways but may coexist. Studies have found that patterns on lung function tests suggestive of upper airway obstruction can be found in as many as 7 % of consecutive tests. While abnormalities on spirometry and flow-volume loops are often the first indicator of airway obstruction and are cheap and widely available, they lack sufficient sensitivity for diagnosis and when suspected airway inspection by bronchoscopy and airway imaging, usually by computerised tomography, are required.